This was done during the Warriors 2013 playoff run! So in case you didn’t know, I’m a HUGE Warriors fan. And I’ve been SO HAPPY lately. Just a week ago, it seemed like dire straits. The Warriors lose Game 1 of the first round of the Western Conference Playoffs in a heart-breaking last-second shot. They lose All-Star Power Forward, double-double machine David Lee to a season-ending injury. The Nuggets were the top scoring team in the league, top rebounding team in the league, and in the midst of a 24-game home win streak. They hadn’t lost since mid-January. Things weren’t looking good… How did the Warriors respond? They went on a tear. They broke the Nuggets home win streak in an incredible shooting display! Steph Curry has been playing like a man-possessed. Jarrett Jack has been phenomenal. EVERY member of the team — Klay Thompson, Andrew Bogut, Harrison Barnes, Draymond Green, Festus Ezeli — has helped pick up the slack in David Lee’s absence. It’s been absolutely remarkable to watch. I was fortunate enough to attend Game 3 at Oracle Arena and it was the BEST game I’ve ever been to! The “Roaracle” crowd was absolutely electric! My ears were still buzzing hours after the game was done. The Warriors pulled out a last-second victory and took the momentum into Game 4. And what a Game 4 it was! The Warriors kept attacking with Andrew Bogut having the best performance of his Ws career. But the Nuggets kept it close. Then in the 3rd quarter, Steph Curry scored 19 points in 4 minutes and 22 seconds. The only way he could have been hotter is if he literally was on fire. The Warriors broke the game wide open and took Game 4 decisively. The Warriors have already come further than anyone expected. At the beginning of the season, no analyst expected them to make the post-season, let alone be the 6th seed. Then when they made the playoffs, no analyst predicted they’d be competitive, let alone be up in the series. Even if they lose the next 3 games, the season can’t be viewed as anything else other than a success. After that resounding Game 4 win, I just felt like I needed to make something to celebrate the team’s success. I decided to make a wallpaper depicting numerous shoots of the team battling the Nuggets at Oracle. I particularly wanted the Warriors fans in the background of images when they could be. I wanted to utilize their playoff-centric motto of “BATTLE. DEFEND. PROTECT. 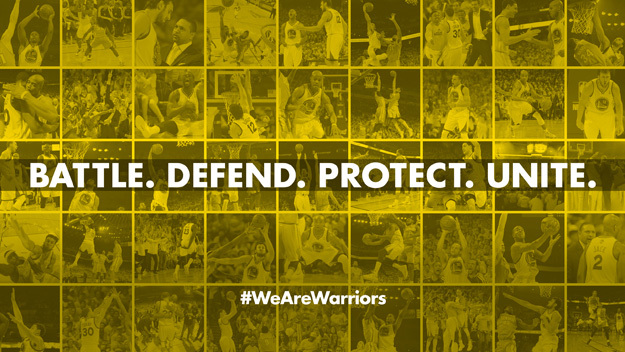 UNITE.” in conjunction with the twitter handle “#WeAreWarriors” over a uniform gold color. I submitted it to the Warriors website and it’s available now for download here! I’m happy to be officially recognized by the organization! LET’S GO WARRIORS! LET’S FINISH THIS OUT AND ADVANCE TO THE NEXT ROUND!